While the new printers sport a number of new features, the undoubted star of the show was a technology that HP has been championing in their commercial print solutions. The new PageWide system uses a newly-designed print head that remains stationary while printing. This, according to HP, results in far higher quality output as only the paper moves through the printer. Traditional inkjets have the print head move across the page as the paper progresses through the feed. The new print head has over 42,000 separate nozzles that deliver the ink. These are arranged and operate so that if a single nozzle becomes blocked or stop working another takes over its function. And, there are no fuser, belts or drums so the number of moving parts is reduced resulting in greater reliability and easier servicing. The new print head is designed to last several years – the expected lifetime of the entire printer. Among the new models announced are several standouts. 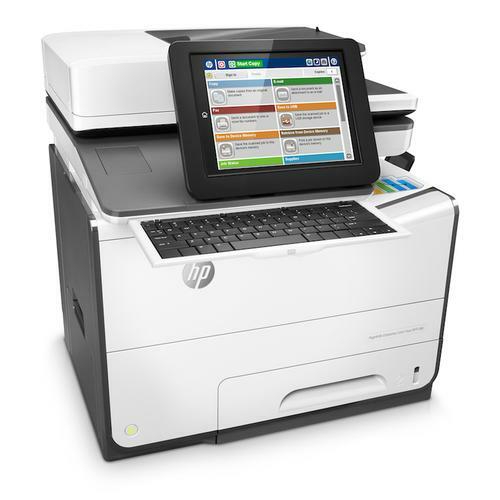 The HP PageWide Enterprise Color 556 (starting RRP is $1,319) and HP PageWide Enterprise Color MFP 586 (starting RRP is $2,886) are designed for small businesses and medium sized work groups printing up to 15,000 pages a month, with a whopping print speed of up to 75 pages per minute. Both are expected to be available in May. The HP PageWide Pro 500 is designed for small businesses and work groups printing up to 6,000 pages a month, with print speeds of up to 70 pages per minute[i]. The PageWide Pro 500 series is available now from $730. A number of new LaserJet models were also announced but, for us, the new portable printers we saw looked interesting. The OfficeJet 200 mobile printer and OfficeJet 250 mobile all in one multifunction offer fast print speeds, customisable touchscreen displays for controlling print jobs and can be used completely wirelessly as the internal battery can charge over USB. Press a small button and a small LED meter tells you the charge level. They work with Android, iOS, Win 10 (including mobile) and support WiFi printing (both as a network printer and by WiFi direct. There’s no out of the box support for Bluetooth but a HP spokesperson mentioned a soltuon would be “coming soon. The OfficeJet 200 will be available in May with the OfficeJet 250 coming later in the year. HP has added a number of new security features to their printers. PIN-secured printing comes standard and can be used with their web printing service so you can remotely connect to a printer, send a job and then have it only print when you get to your destination and enter a PIN. This was previously only available as a paid-for service but is now available for free. The new printers also check the integrity of their BIOS and, if an anomaly is detected, the printer automatically restarts from a certified “gold” version of the firmware. In addition, any unauthorised attempt to access the new printers is blocked through an integrated Intrusion Detection System that can report security event to logs that can be analysed through many commercial Security Event and Incident Management (SEIM) systems. Anthony Caruana travelled to Macau as a guest of HP.